Aerolite PCF815 Floral Pink is a beautiful looking, modern and stylish three-piece lightweight luggage set of 22, 29 and 32 inches in rose gold and pink for women. It has a very high rating on both US and UK Amazon websites and it is definitely very good value for money. The 22” cabin bag weighs 5.5 pounds with the dimensions of 21.7 x 13.8 x 7.9 inches, and has a 35 liter capacity. It can be used as cabin luggage in a lot of domestic airlines including United Airlines, Alaska Airlines, JetBlue Airways, Volaris, Delta, American Airlines, Sun Country Airlines, Hawaiian Airlines, Southwest Airlines, Spirit Airlines, and Allegiant Air, as well as many international airlines. The medium 29” suitcase weighs 7.7 pounds, has the dimensions of 24.8 x 18.9 x 10.5 inches and a 77 liter storage capacity. The largest 32” suitcase is 9.2 pounds, has a 112 liter capacity and measures 31.1 x 20.9 x 11.8 inches. Both the 29” and 32” suitcases have to be checked in before your flight. They come with the four sturdy dual spinner wheels that give extra stability to the bags and roll smoothly and quietly as you hold and push or pull the solid telescoping handles with push-buttons. They have the three-digit combo barrel padlocks that are preset to 0-0-0 and can be changed to any digits you shall remember easily. These are some of the lightest hardshell suitcases around and let you pack in more than you normally would, which is also helped with the great organizational pockets. This set is easy on the eyes, very nice to look at- even nicer than they look on the photos. The exterior shells are not as hard as you may expect them to be but this may mean more flexibility and durability against impact. 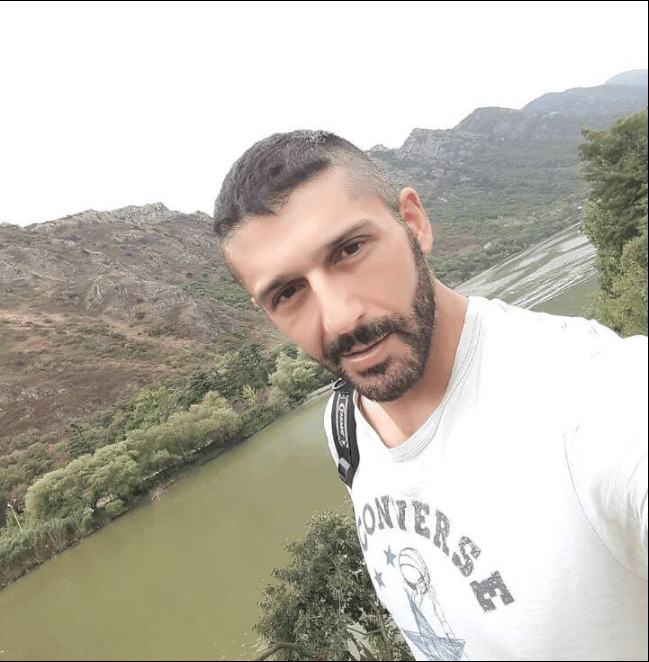 They are very good quality with a premium look and feel and you should not have any question marks in your head about the construction quality of these bags. With the nice floral pattern they will be very easy to pick among a crowd of bags on the airport carousel. They are spacious inside and your clothes and other smaller items will be kept secure inside the extra zipped compartments. There is a great layout inside with these compartments and straps. 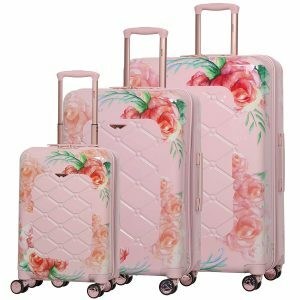 Aerolite Floral Pink Luggage Set is sent quickly via Amazon.com and you should receive them within a few days depending on your location in the US or the world. Some frequent travelers reported them to prove strong over their many different travels and that they are still in perfect condition. 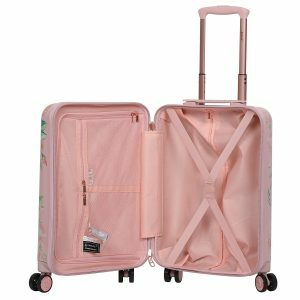 If you are on the market for a sturdy and flexible luggage set with a lot of space inside and that looks nice and feminine and that doesn’t cost a lot, we do not hesitate to recommend the brand new Aerolite Floral Pink. This is a very good quality set that is offered with a generous warranty of ten years by Aerolite, and you can certainly have a peace of mind.